The transracial adoption of an African American newborn is a time for celebration. While of course any adoption is a blessing, there are also issues that will arise that parents must be ready to address. Numbers: Because the number of Caucasian newborns available for adoption is much lower than children of other races, pursuing a transracial adoption often means adopting a child in a shorter time frame. Age: Many adoption agencies simply will not accept applicants who are over 40 as adoptive parents of Caucasian babies. This stipulation often doesn't apply to a transracial adoption, however. Need: Some parents want to adopt a child of another race because they realize that there are so many of these children who need good homes. Experience: In some cases, families seek to adopt outside of their culture because they want to expand their family's own experiences. This is especially true if they already have biological children of their own. Before you enter into the adoption process of an African American newborn, you need to prepare yourself for several issues. Hopefully, the agency that you use to facilitate the adoption will cover many of these topics and provide continued support after the adoption process is finalized. If you pursue an independent adoption, however, you may not receive any counseling or training services, so keep the following in mind. Involve friends and family. While you may be perfectly comfortable with adopting an African American newborn, your family may not embrace this issue as easily. Involve them in the adoption process, giving them updates as you move toward the goal of adopting a child. Discuss with them your wishes and expectations as to how this child will fit into the family. While it is alright to listen to their opposing viewpoints, you will have to learn to calmly fend off any negative comments that come your way, both now and in the future. Examine yourself. Your family will be viewed as different once this newborn has entered into your home. Can you handle this? What is your attitude regarding race and cultural differences? Are you prepared to embrace another culture for your child's sake? Look at your town. How difficult will those in your neighborhood or town make life for you and your child? They may be just as accepting, but how will you react if they aren't? Are you prepared to seek out a new neighborhood, school district, or even city if necessary? Focus on the future. While you will expect your child to accept your values and beliefs, can you also accept his cultural differences? Will you go out of your way to help him discover his culture and ethnicity, such as cooking ethnic foods, attending multicultural festivals, and making friends with others who are ethnically different? 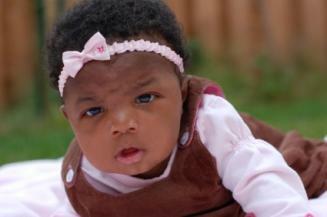 Would you consider adopting another African American baby in the future? Be prepared for misconceptions. Throughout your child's life, there will be people who will make unkind and ignorant comments. Think about how you will respond, but most importantly, prepare your child for these events as well. Teach him how to respond in a positive and firm manner. For example, when he is questioned as to whether you are his "real family", how do you want him to respond? Get involved. If there are members of the community who promote racism, now is the time to become an activist for racial equality. Educate yourself. It is not only important that your child learn about his or her culture but that you do also. Study all aspects of the African American culture, such as history, literature, music, etc. Build a support system. Give your child a strong background and a solid foundation for positive self-esteem by surrounding your family with supportive relatives and friends. Discuss race and culture with your child. You should begin to do this while your child is just a baby. Do not tolerate negative comments toward yourself and your child. You are your child's protector and advocate! Finally, love your child. Love him for his differences, his culture, his appearance, and especially for the blessings he has brought to your life.